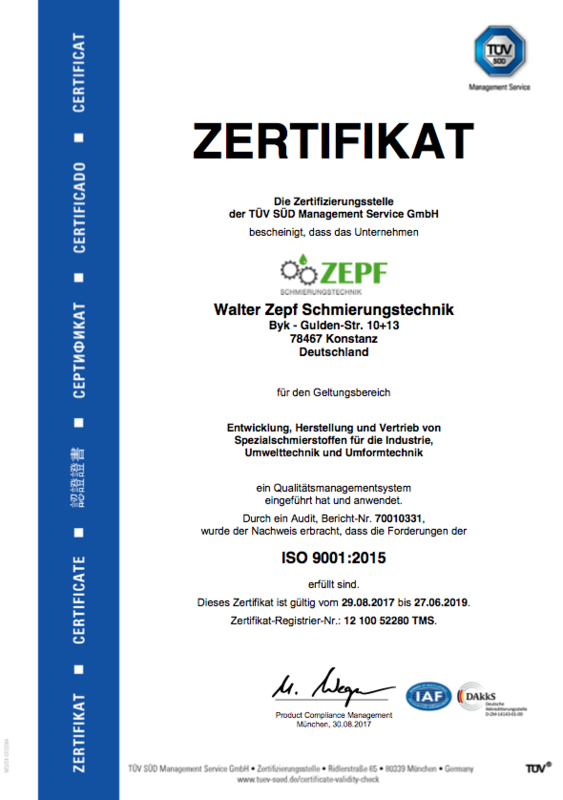 The responsible authority for data processing of this website is the company Walter Zepf Schmierungstechnik, Byk-Gulden-Straße 10 and 13, 78467 Konstanz, Germany. The processing of your personal data is in accordance to the German and European data protection law. Walter Zepf Schmierungstechnik operates on the principle of data avoidance and forgoes the survey of personal data as far as possible. The data transfer of this website occurs via a SSL-encryption. Data, that is send from your browser to the server and vice versa, is encrypted by Secure Socket Layer (SSL). Thereby, the data is protected. We train and oblige our employees to work in accordance with data secrecy, especially in accordance with provisions of the European General Data Protection Regulation as well as further data protection regulations. We accept no liability towards third parties for noncompliance of the European General Data Protection Regulation as well as further data protection regulations by our customers, especially licence partners. You can use this website without registration. Only by using the contact form or by placing an order are non-anonymous data created. A necessary amount of your data is automatically collected ans saved in the course of an order or by using this website. This data is automatically anonymised for further processing. Personal data arising in the course of placing an order are preserved for the necessary duration required by current regulations. If we want to use your personal data for promotional or marketing purposes, we will ask about your explicit consent beforehand. Through this website, we only collect personal data (e.g. names, addresses or mail addresses) if you voluntarily provide such data or agreed to this or if the relevant regulations on the protection of your data allow for this. If you send us emails, we collect, process and use your personal data for the transaction of our services offered including relevant correspondence or maintaining customer relations. By filling the contact form you agree that the data is saved for the processing period and taken in the customer file if necessary. We use the personal data, that you provide us, to support and inform our customers and interested parties according to the regulations of the Federal Data Protection Act as well as to other relevant privacy protection regulations. The personal data is used to answer your questions, process your orders or to provide access to certain information or offers. Furthermore, it can be necessary for maintaining customer relations that we save and process your personal data to better respond to your needs or to further improve our products and services. In addition to this, it can be necessary that we or a third party on our order use the personal data to inform you about offers, which are useful for your business activities, or to better satisfy the problems and needs of our customers. Of course, we respect and understand if you do not want to provide personal data to support our customer relation. We will not sell your personal data to a third party or will commercialize them otherwise. Events in connection with your activities on our website (e.g. the viewed pages, the time per page etc.). Information on your device like the type, the operating system, the version as well as your country of origin and region. The arising data is anonymised automatically before collecting and hence can only be processed anonymised. This website uses Google Analytics, a web analytics service provided by Google, Inc. (“Google”), 1600 Amphitheatre Parkway Mountain View, CA 94043, USA. Google Analytics uses “cookies”, which are text files placed on your computer, to help the website analyse how users use the site. The information generated by the cookie about your use of the website will be transmitted to and stored by Google on servers normally in the United States. This website expanded the Google Analytics Code by “anonymizeIp” to ensure an anonymised tracking of IP-addresses. Hence, Google will truncate/anonymize the last octet of the IP address for Member States of the European Union as well as for other parties to the Agreement on the European Economic Area. Only in exceptional cases, the full IP address is sent to and shortened by Google servers in the USA. On behalf of the website provider Google will use this information for the purpose of evaluating your use of the website, compiling reports on website activity for website operators and providing other services relating to website activity and internet usage to the website provider. Google will not associate your IP address with any other data held by Google. [mm_ga_cookie_optout_eng] (the opt-out is only valid for this browser and only for thisdomain). Further information concerning the terms and conditions of use and data privacy can be found at http://www.google.com/analytics/terms/gb.html bor https://www.google.de/intl/de/policies/. In order to take care of adequate data safety while transmitting data of the contactform, we use in specific cases Google Inc’s service reCAPTCHA. In particular, we use this service to test whether the contactform is used by an natural person or improperly used by an automated programm. Google Inc’s service includes the sending of IP adresses and if necessary further data needed by reCAPTCHA to Google. Therefore different data protection regulations of Google Inc. hold. You can find further information about Google Inc’s data protection regulations under http://www.google.de/intl/de/privacy or https://www.google.com/intl/de/policies/privacy/. To protect your personal data against unintentional or illegal deletion, change or loss and against unauthorised transfer or access, Walter Zepf Schmierungstechnik implements technical and organizational security measures. The websites of Walter Zepf Schmierungstechnik contain links to other websites. Walter Zepf Schmierungstechnik is not responsible for data protection policies or content of those websites. If you have questions regarding the data processing or the assertion of rights of objection, you can send an email to christoph.zepf@walter-zepf.de. If you have questions regarding the data protection of Walter Zepf Schmierungstechnik, send an email to christoph.zepf@walter-zepf.de. You can request to see your saved personal data. Basically, this is free of charge. After the exchange of information Walter Zepf Schmierungstechnik is going to perform corrections, blocks or deletions immediately. Furthermore, the European General Data Protection Regulation allows you to complain to regulatory authorities about possible violations.